Spells There are 2 products. Break undesirable Spells and make new desired ones. Cast Love Spells to bring your loved one. Obtain true happiness with the help of the best Spell Caster. 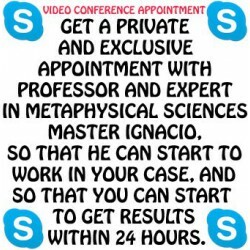 Make a Skype appointment today and start getting results within 24 hours after Master Ignacio begins to work in your case. Stay in control of your life... Destroy any undesirable spell and make any desired one through the highest parapsychology channels than we are allowed to have. Make your written request today.